Miracle-Gro Miracid Plant Food feeds acid loving plants including Rhododendrons, Azaleas, and Hydrangeas. This product allows for double feeding action - through the leaves and roots. Starts to work immediately to promote quick, beautiful blooms and strong root development. Why was Miracle-Gro Miracid Plant Food discontinued? We are not certain exactly why Miracle-Gro Miracid Plant Food was discontinued, however it appears that Scotts has replaced it with a different product for acid-loving plants that is water-soluble and much safer around turf and other ornamentals. Miracid may cause burn on non-target plants and turfgrass, so you must be very careful applying it. We do carry many other fertilizers for acid-loving plants from Ferti-lome, Dr. Earth, and FoxFarm, among others. You may browse all our Plant Fertilizers here. Can I use Miracle-Gro Miracid Plant Food on Arborvitaes? 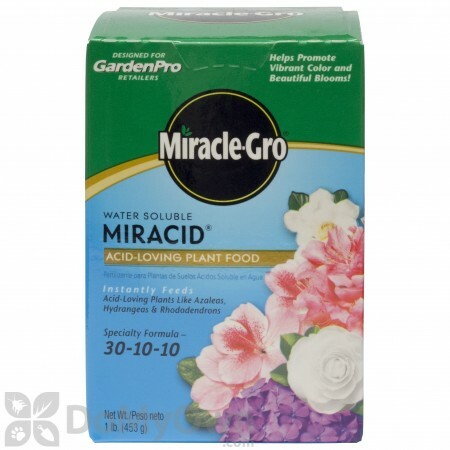 Miracle-Gro Miracid Plant Food is designed to be used for acid-loving plants such as hydrangeas, azaleas, and rhododendrons; it is not appropriate for evergreens such as arborvitae. You can browse our other water soluble fertilizers here. How much Miracle Grow Miracid do I put in my hose garden feeder? I used to get individual packets. Per the manufacturer, if you are using Miracle-Gro Miracid Plant Food outdoors, you will use 1 tablespoon per gallon of water. I plan on using Miracid on my Junipers, since in the past I've had good results foliar feeding them.Other Suggestions? Miracle-Gro Miracid Plant Food is one of our most popular recommendations for acid loving plants like Junipers. We would recommend to stick with it! 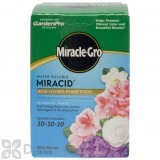 How much Miracle-Gro Miracid Plant Food do you need for 100 gallons of water for a foliage spray? Per the manufacturer, if you are using Miracle-Gro Miracid Plant Food outdoors, you will use 1 tablespoon per gallon of water. For 100 gallons of water, you will use 6.25 cups. If you are using this product for indoor plants, you will use 1/2 teaspoon per gallon of water. For 100 gallons of water, you will be using 1.04 cups. Please let us know if you have any additional questions.